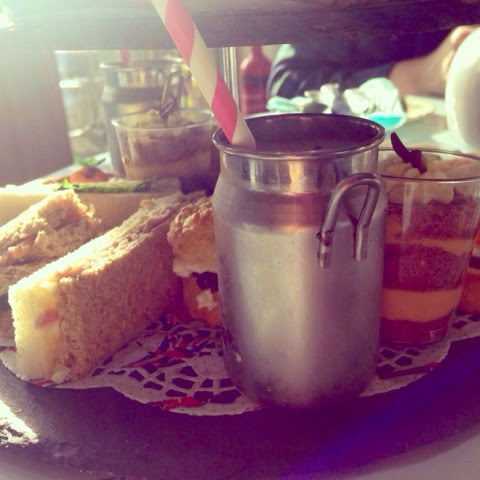 It has to be said, taking Afternoon Tea every week (as fun as that sounds and is!) can get a little repetitious as the many cupcakes and creamy things tend roll into one. So every now and again it’s great to experience a tea that surprises you, has a theme or does something just that little bit different. This week, that place was The Wellbeing Farm. Located in the rural backdrop of Bolton, this tea room is surrounded by stunning views of green fields and hills with a few animal friends to keep you company – it was a shock to drive past a free roaming llama we must admit! Sweets for the new season. 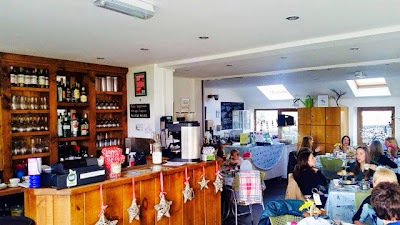 Starting with a choice of bottomless pot of tea or coffee we started as we meant to go on. 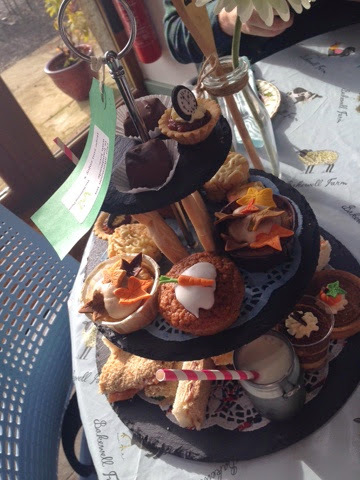 The autumnal themed tea arrived on a rustic style black stand and was chock full of tea time treats. Starting with a good selection of sandwiches on mixed breads we had; smoked salmon with cream cheese (a clear winner), traditional cucumber, ham and poached chicken. Gorgeously fresh and a nice range of flavours. Shortbread represent animals on the Farm. Next, instead of having scones on their own separate tier we were treated to a feast of delicious homemade pre-spread scones, cakes, mousse and pie. The entire selection was woven together by a seasonal theme of autumn flavours and imagery. 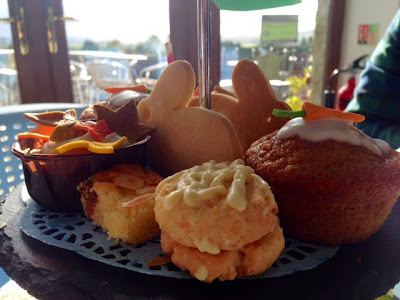 We had; a yummy spicy pumpkin pie, chocolate and butterscotch mousse, coconut and white chocolate biscuit, carrot cake, chocolate fudge, apple and cinnamon cake, almond cake and shortbreads in the shape of animals from the farm. Whoever said less was more – was lying. 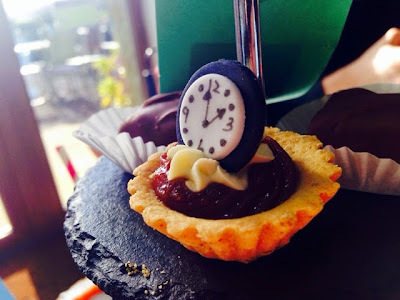 By far one of the most adorable sweets on the stand was a miniature fruit tart complete with handmade clock decoration to signify the time change last weekend. A really unique (and useful!) idea. Reminder to change the clocks! On top off all that and perhaps one of our favourite bits was a mini milk churn of homemade vanilla milkshake served with one of the best food accessories in the world – stripy paper straws! Just in case you don’t quite manage to finish all of that in one sitting, the lovely staff are happy to box up any leftover cakes for you to take home. Special mention must go to the great service at The Wellbeing Farm where the staff couldn’t do enough for us, kept our teacups topped up and our lovely host Celia took the time to tell us a little about the Farm’s history. 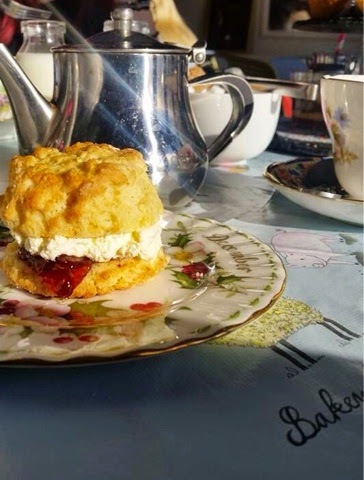 The Wellbeing Farm is a gorgeous place for tea with its perfect views and endless amount of cake. The attention to detail from the mini pumpkins down to sugar leaves on cakes, makes this a very special Afternoon Tea. If you’re looking for something different this season particularly for a family outing, The Wellbeing Farm is exactly what you need. 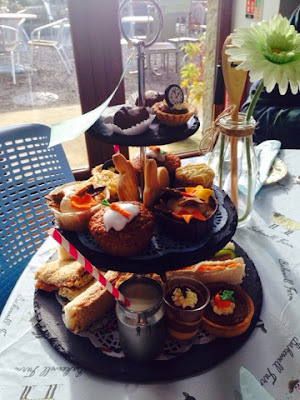 We can't wait to go back and try the Christmas tea! The Wellbeing Farm is located on Plantation Road, Edgworth, Bolton. Afternoon Tea costs just £15.95 per person. For more information and to book visit www.thewellbeingfarm.co.uk.